This past semester I took the course “Practicing Archaeology” with Professor Giblin at Quinnipiac University. 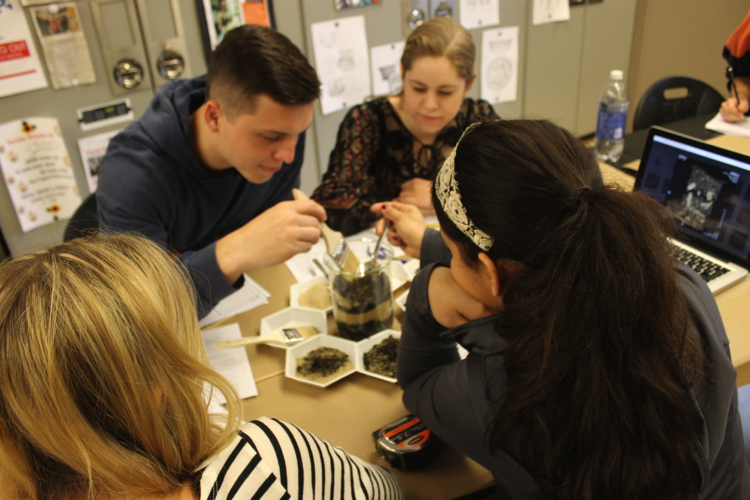 The final project in class was to design a lab exercise that would help students learn a key concept in archaeological methods. I wanted to come up with a lab that would not only be interesting and allow us to put what we had learned in class into practice, but would also give me data and an idea of what I could be doing in Hungary this summer as part of the NSF-REU BAKOTA field school. The general idea was easy enough to come up with, find some way to combine my background in radiology with my enjoyment of archaeology. That was the easy part, actually coming up with a lab was much harder than I thought. 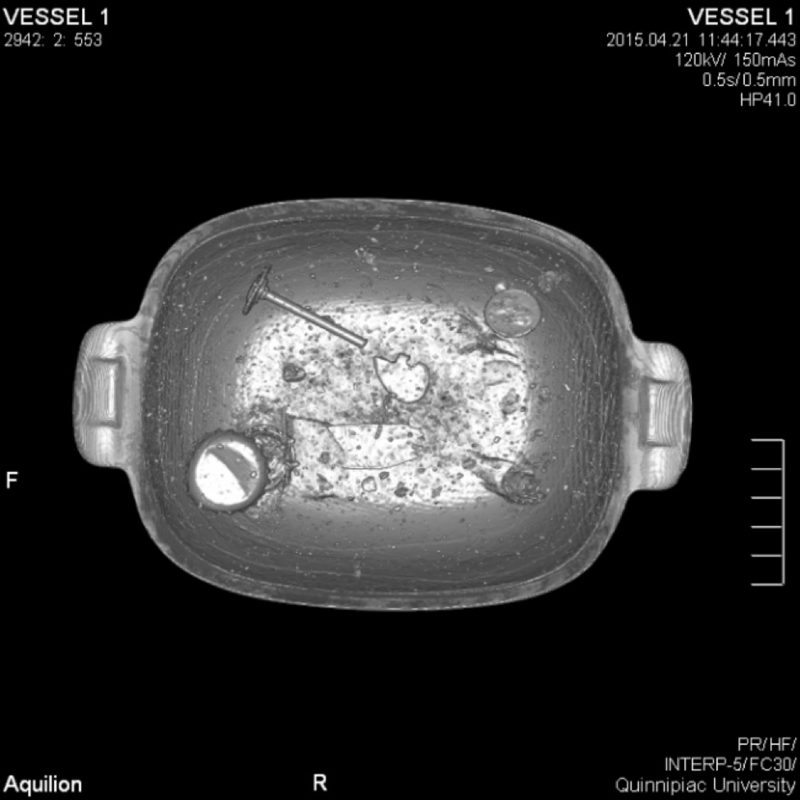 In the end I decided to use CT images to create ‘road maps’ for determining the content and micro-excavation of mock archaeological vessels. In class, we had learned about how the BAKOTA project is excavating a cemetery that contains many cremation urns: ceramic vessels with archaeological material inside. I decided to attempt to replicate these vessels with various types of “artifacts” that might be found in prehistory (bone, metal, wood, etc.) and a few things just for fun (bottle caps, centrifuge tubes, gum, etc.). Five different vessels were chosen. 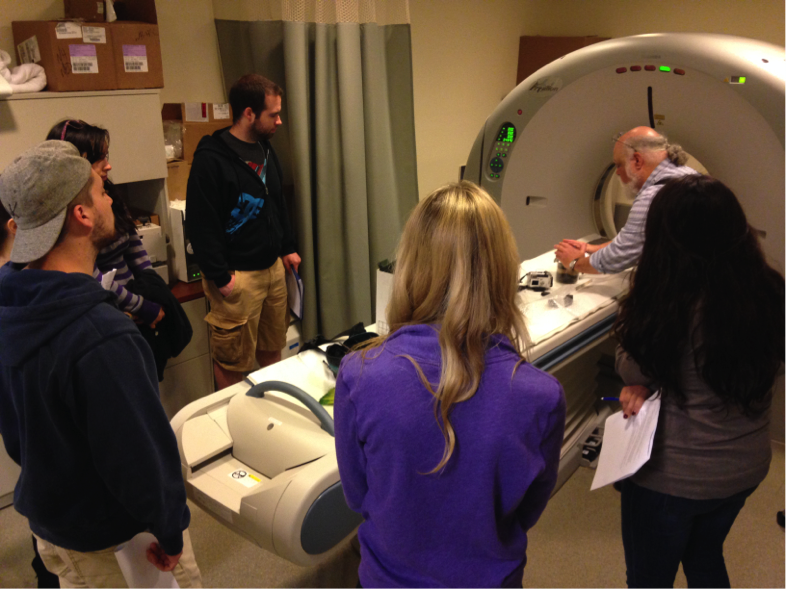 Once the materials were buried in a striated matrix of sand and mulch like material, they were taken to the Quinnipiac University North Haven campus and put through the CT scanner in the Diagnostic Imaging department. This was also a way to show many of the students what goes on at the other campus. After the scans were completed it was time to go through and select images that would be useful in the micro-excavations. This was also when the Hounsfield Units would be recorded. These values are unique to every material and correlate to the density of every material. 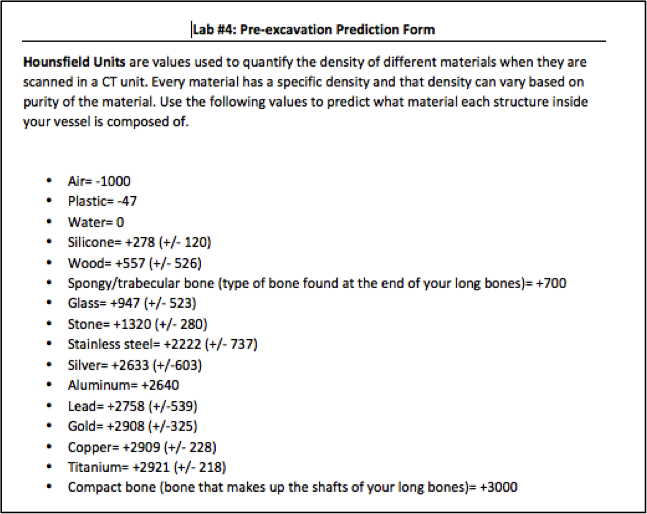 The students were instructed to use these values to determine what the materials buried were before they performed the excavations. Due to the discrepancies between the values recorded and the chart provided this was harder than expected, as many were off the charts based on what was provided. Another problem that was faced here was that some students didn’t understand the set up and standard deviation ranges that were provided. Coming up with a more uniform scale would not only be beneficial to the labs in the future but also for using CT scans in archaeological research. Another area that students had trouble with was the orientation of the images to the vessel. On the beakers it was easy because of the spout, however on the other three it was harder do to the symmetrical shapes. I believe marking I side or point on the vessels for reference before scanning them would be a good idea so that everyone can orient themselves. After the predictions were made it was time to dig! Many students seemed to enjoy this aspect as they were able to see what was buried and see how well they predicted it. They were also doing an archaeological excavation in an archaeology class. Most of the predictions were slightly off but some were spot on. Coming up with the uniform chart and also making sure people know how to read standard deviation charts would also be beneficial. One of the amazing things that was seen while I was going through the scans and was also mentioned by Jerry Conlogue, one of the DI professors who helped with the scans, was that you could actually see the details on some of the coins. This raises a question for a future research project as details at this level haven’t been seen in the past. The question is this, what orientation do the coins need to be in for the scans to pick up the details? 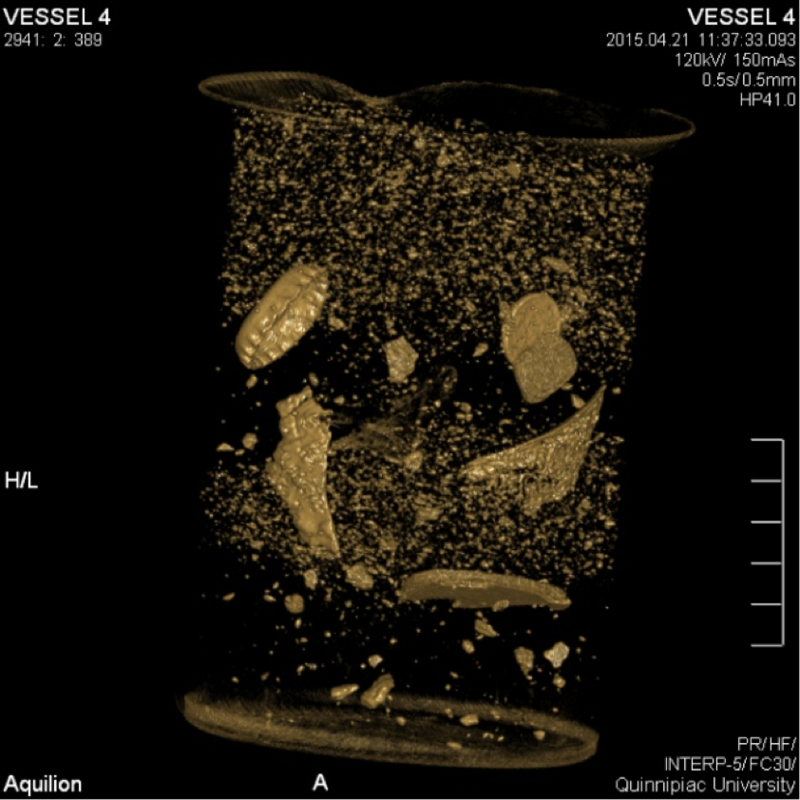 3D reconstruction of vessel one viewed in an axial approach. Notice the detail on the penny in the upper right corner. A second project idea that we have had is to do scans of pre-burned bone and bone that has been burned at different temperatures for different lengths of time to see how this will alter the Hounsfield Units. This will not only beneficial for the BAKOTA project where many of the bodies were cremated but to the archaeological community as a whole as there are other cremation sites out there. Stay tuned for more results! ← Update from the lab: Fun with GIS!